Originally from a small coastal town in Massachusetts, Garrett Doherty’s cuisine reflects his journey across the country, the cities he has lived in, and people he’s encountered over the years. 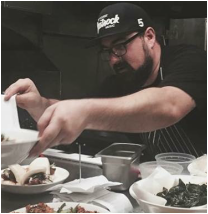 Garrett began working in restaurant kitchens in Rockport, Massachusetts as a teenager but left the industry when he moved to Boston and to Los Angeles, where he lived for 10 years. He eventually moved to Seattle and enrolled in the Seattle Culinary Academy in 2007. After culinary school, he worked in kitchens at the W Hotel and at the private dining club, The Ruins, where he became Head Chef of the bistro in 2011. Garrett co-Founded Kraken Congee with fellow cohorts from Seattle Culinary Academy, and was featured on the first season of “Restaurant Startup” on CNBC, where they won the opportunity for a brick-and-mortar restaurant partnership with Chef Tim Love. This came to fruition in April, 2015, when Kraken Congee opened in the Pioneer Square neighborhood in Seattle. In addition to his role as co-chef/co-owner of Kraken Congee, Garrett has been partnering with other local and national chefs for a monthly pop-up called "Kasama Dinners", which features new and innovative takes on Filipino cuisine. Garrett’s cuisine and flavor profiles are heavily influenced by the seafood of New England and the Pacific Northwest, and the diverse cuisines found in Boston, Los Angeles, and Seattle.